Can You Relax? Try This. Greetings on this fine day on planet earth! I am deep in the finals of my novel, and up against a new deadline. As such, we’re turning to our friends at Ask.com for a 2009 gem about my husband’s greatest need – the ability to relax and enjoy the life around us. Your mind can take to you any destination in the world to relax - from where you are. To relax can be quite difficult for some personalities. We spent an amazing night together with our faith community and school, daughter and the Public Pool last night with an annual “back to school” party. It was an amazing feeling to be cradled in my hubby’s arms, dancing in the water, watching our daughter laugh in the evening sunlight. I can only wish that all of you have those moments of true happiness in your life. But if you’re not relaxed, they can pass you by. While I was busy getting throughly trashed by a “friend” my husband was learning how to relax…and his life is soooooo much better. You try. The skills of becoming relaxed when necessary and remaining relaxed whenever possible can be transformative, and can make a measurable difference in health. This is because living in a state of chronic stress–remaining physiologically stressed over long periods of time, without triggering your body’s relaxation response–can impact your health in a variety of negative ways. Learning to become relaxed readily and easily can bring a healthier and more enjoyable life. Breathing exercises are a terrific way to become relaxed quickly and easily–they can be done by just about anyone, anywhere and at any time. Slowing your breathing, breathing from your diaphragm, and even using breathing visualization are ways to use breathing exercises to relax your body and your mind. Here’s a simple breathing exerciseto get you started. Sit or stand in a relaxed position. Slowly inhale through your nose, counting to five in your head. Let the air out from your mouth, counting to eight in your head as it leaves your lungs. Repeat several times. That’s it! As you breathe, let your abdomen expand outward, rather than raising your shoulders. This is a more relaxed and natural way to breathe, and helps your lungs fill themselves more fully with fresh air, releasing more “old” air. You can do this just a few times to release tension, or for several minutes as a form of meditation. If you like, you can make your throat a little tighter as you exhale so the air comes out like a whisper. This type of breathing is used in some forms of yoga and can add additional tension relief. A few seconds or minutes. A minimal amount of attention. Meditation is a very old, proven strategy for becoming and remaining more relaxed. Popular in the east for centuries, it’s enjoyed a huge rise in popularity in the West in recent years as researchers have found proven benefits in scientific studies. Meditation isn’t difficult, but it does take practice. Fortunately, regular practice can help you to feel relaxed during and after each session and, over time, can actually help you to be less reactive to new stress you face. Progressive Muscle Relaxation, or PMR, is one of my oft-used methods of getting relaxed quickly. 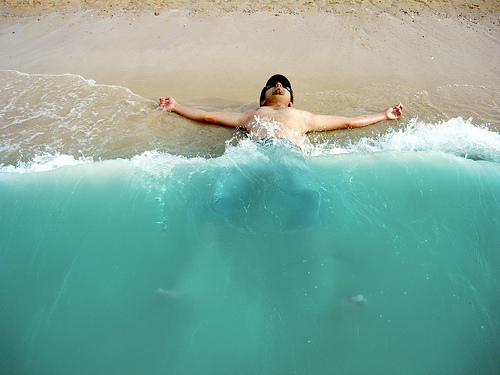 The technique involves tensing and relaxing muscles systematically from head to toe (or from toe to head), thereby releasing tension and ushering in the relaxation response. With practice, this technique allows for total-body relaxation in a matter of seconds. And it’s easy! Search for more information on Progressive Muscle Relaxation to better acquaint you with this lesser-known but very effective method of becoming quickly relaxed. Because the body reacts physically to imagery created by the mind, visualizations are an effective form of getting relaxed, and are as simple and fun as daydreaming. There are many, many different visualizations you can try to get more relaxed and reverse your body’s stress response. You can visualize yourself in a relaxing location, visualize a positive result from a stressing scenario, or, more simply, just visualize tension and stress leaving your body with each breath! Here’s a nice breathing visualization to get you started. Laughter is a wonderful, natural way to release tension in your body and get your mind in a better place so your stressors don’t seem so…stressful. If you have the time, I heartily recommend seeing a nice, funny movie, or reading a funny book to get a little laughter into your day. But if you don’t have the time in the schedule for that, simply maintaining a sense of humor throughout your regular day can help quite a bit in the way of keeping you relaxed. Read more about the benefits of laughter, maintain a sense of humor, and you’ll have a great new tool for stress relief, if you don’t use it already. first, you can adopt the thinking style of optimists by interpreting certain facets of a situation in a way that brings hope and eliminates self-doubt. You can also adopt the view that you may have more power in a situation than you realize (called having an internal locus of control, which is also known to eliminate feelings of stress), and then looking for new solutions. Finally, be sure that you’re not already sabotaging yourself with overly negative thinking, and read over these common distorted thinking patterns, or cognitive distortions–do any sound familiar? If so, you can become aware of them and eliminate this type of thinking. Whatever strategies you use, practice them and use them often, and you can maintain a much more relaxed lifestyle.